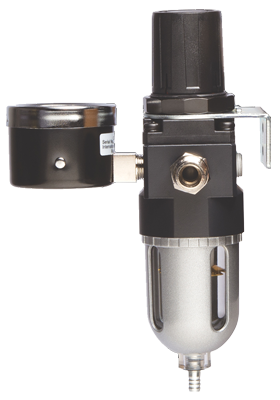 This Iwata air pressure regulator and moisture filter is part of the Iwata Workstation range of products that work together and keep your cleaning area all in one spot. The bracket supplied with this regulator fits onto the Iwata Universal Airbrush Holder using the screw provided with the airbrush holder. 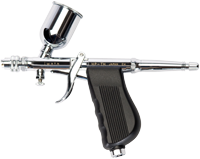 The airbrush holder in turn connects to the Universal Spray Out Pot to build the complete Iwata Universal Workstation system. 1/4 BSP inlet and a 1/8 BSP outlet, to which various adapters may be fitted. Mounting bracket for fitting to the Iwata Universal Airbrush Holder.